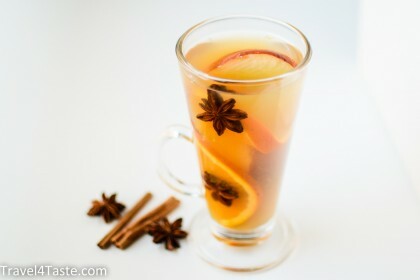 If Summer is about Sangria, Winter about Hot Wine, than Autumn should be all about the Hot Apple Cider! Made with wonderful spices, orange and honey this delicious drink will warm you up! And if you like it a bit stranger you can fortify it with little drop of orange liqueur! 1. Pour the cider into a saucepan. Add cloves, allspice, cinnamon sticks & star anise. Heat it up on the medium hot stove and boil (very slowly) for about 5min. Put it off the heat, cover it and leave for 10min. Put it back on the stove and boil (slowly) for another 5min. 2. Serve it hot. You can fortify it with a bit of orange liqueur. This entry was posted in Alcohol, Christmas, Dessert, Drink, France, Fruits, Germany, Gluten Free, Vegan. Bookmark the permalink.